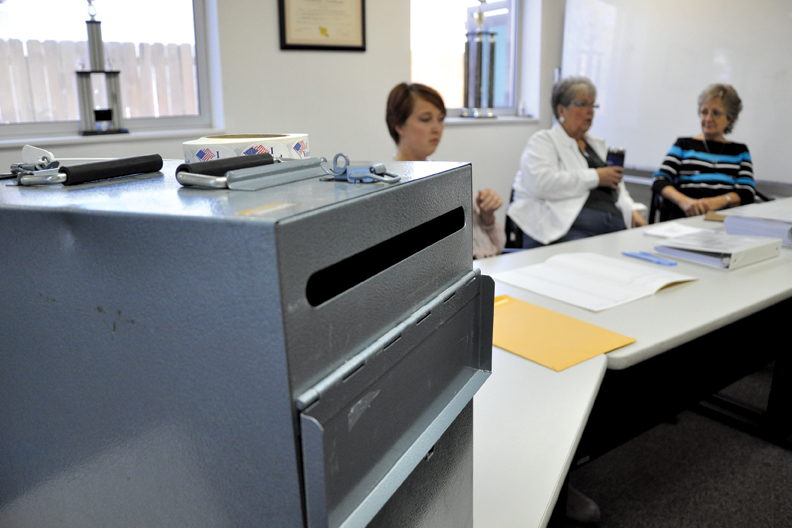 A ballot box sits Tuesday in the Craig Fire/Rescue station, 419 Yampa Ave., as election judges Kirstie McPherson, left, Peggy Hough and Linda Riley, right, wait for voters. The polls are open from 7 a.m. to 7 p.m. today. Note: Participants could vote for up to two candidates. Two incumbents sealed another term on the Craig Rural Fire Protection District Board during an election Tuesday. Byron Willems, the board’s president, received 73 votes in the fire board election, and board member Alan Webber garnered 77 votes. Talia Johnson, who moved to Craig with her family in August, also put in a bid for one of the two four-year seats open on the board. Johnson hails from Rush, a town east of Colorado Springs, where she served on the Tri-County Fire Protection District Board for about three and a half years. She also served as a volunteer firefighter for five years on the Tri-County Fire Department, she said. She was undaunted by Tuesday’s defeat. “Look for me in future elections because I’m not going to give up,” she said. The election results extend the tenure of two longtime board members. Willems, owner of Craig Fire & Safety Inc., served his first term in the late 1990s or early 2000s while he was still an active firefighter with Craig Fire/Rescue, he said. He stepped off the board for a time before returning in 2006 when he was appointed to fill an uncompleted term. Webber, a planning supervisor at Tri-State Generation & Transmission, was appointed to the board in October 2005, where he served temporary stints as its president and treasurer, he said. “I’m glad to see that Byron and I both were re-elected because I think this board has done a lot,” he said. “The five guys that we’ve got on there right now have really accomplished a lot in the last couple of years, and we’ve got more to accomplish. “I guess you have to look at (the election results) as a show of support,” he said. A total of 86 people turned out for the election, in which participants could vote for one or two candidates, said Ashley Ellis, the fire district’s designated election official. Turnout for the fire board elections, which take place every two years, is usually comparatively small. About 80 people voted in the election four years ago, Ellis said. The scarce showing Tuesday was “disappointing,” Webber said. “That’s very disappointing when we hear such people in the community that aren’t happy, but then they don’t get out and vote,” he said.